Who isn’t always looking for new ideas for their bulletin board! 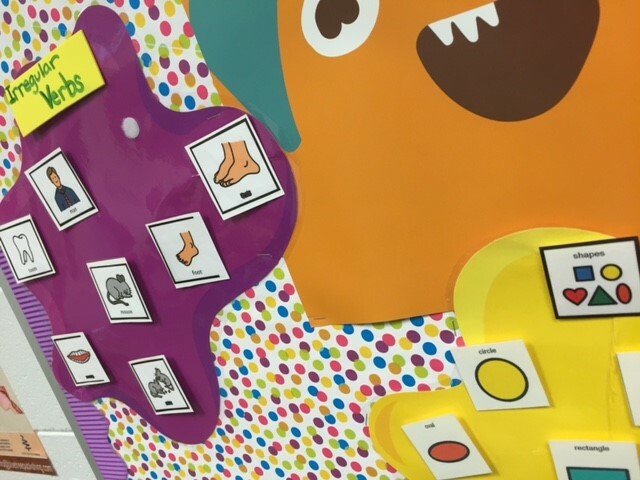 Today, Jessica Oliver (SLP at TJ and Lassiter Middle schools) shares with us a fun, productive way to utilize those big, blank bulletin boards!! As we begin a new school year, there are a lot of things to consider. We have new students to schedule, new teachers to work with, and new therapy ideas to use or create. For me, this year also came with a new room. In my new room was a very blank and ugly bulletin board which needed some loving care. I remembered that during a PD this summer, one of our colleagues discussed behavior and ways to incorporate movement into therapy. One of those ideas included interactive stations. What better way to use a bulletin board?!?! Below are the photos of my board and a discussion about how I set up and will use my interactive bulletin board. I chose to cover my board using a multicolored wrapping paper and used a “speech monsters” theme. I bought free form poster board placemats from Hobby Lobby (in the party décor section) to create the activity areas of the board. However, you could use square small colored or white poster boards or even construction paper. I laminated the placemats and attached Velcro to them. The Velcro is placed to include the ability to pair things on a single work space with a spot for the activity label at the top. Since I work in a middle school, some of my students are taller and I placed my work space areas with this in mind. I also liked the idea of some students being able to jump a small jump or stretch to place cards. This incorporates controlled movement into the session and will be great for students who have sensory/movement needs. If you have shorter students (elementary age) you may want to place your squares on a lower level. I used several different methods to create cards for the board. For labels, I used foam squares (you can get them at Walmart), bulletin board decorations (Hobby Lobby), top loaders for baseball cards (Walmart), and laminated board maker pictures. I wrote labels with marker on the foam and bulletin board pieces. I also labeled some activity centers with Boardmaker pictures (such as the category for shapes). The top loaders are great for using articulation cards or other drill cards you may already have. You can place them in the top loaders and remove them when you switch the topic of an activity center. Boardmaker pictures also work great and often you can use things you have already created to provide an activity for a student. 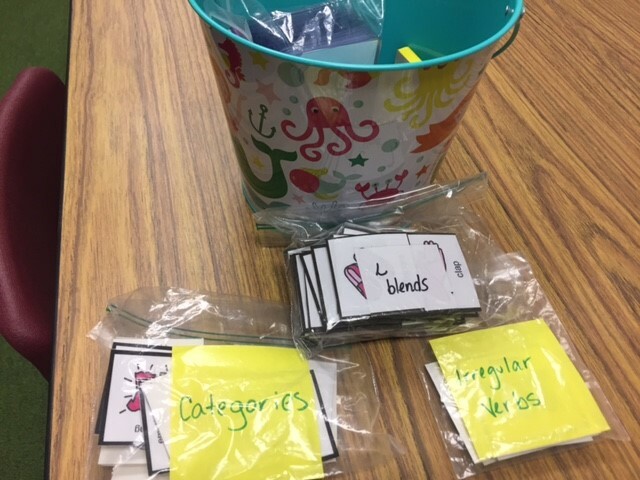 To keep everything organized, I keep the cards in labeled bags in a bucket near the board. I use an old Easter bucket that belonged to my daughter. This board allows me to work on several activities at once. Some students can work on articulation, while another works on language concepts. I can have students use the whole board for categorization and label each work space as a category (food, clothing, school supplies, etc.). I can also have a student place pairs of synonyms, irregular verbs, and antonyms. 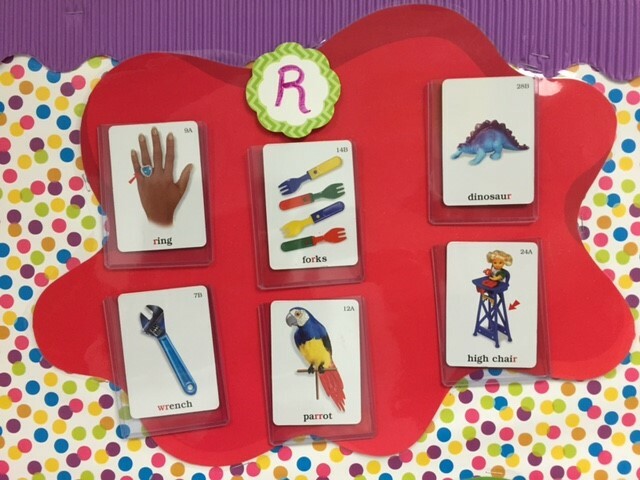 For articulation, the student can receive a card to place as they drill their sounds. They can place cards in initial, medial, and final positions on the board or they can choose words to work on from the board. If you have a student with voice or fluency issues, you can have them label good and bad habits/speech. You can also have fluency students place a card in either a bumpy speech center or a smooth speech center to increase awareness about their fluency. The possibilities are endless! If you don’t have a board in your room, there are Pinterest posts on how to create one with a background, painter’s tape, a hot glue gun, and border. It allows you to add color to your room without damaging the walls! You can also create stations like this on a blank wall without the use of a large board. I’m hoping to gain the students interest and make speech more interactive with the use of this board. Hopefully you will also find this to be a great asset to your speech room in the future! Thanks, Jessica! What a fabulous way to use vertical space in your office! What do you want to improve on in speech/language? Why? What things do you struggle with in the classroom? How can we address and improve these things as they relate to speech/language? What subskills are required to accomplish these tasks? Reflect on progress made over the past year. Have those goals been met? What factors contributed to meeting or not meeting those goals? Students may be able to give you input about what types of teaching and activities help them the most. This information may be helpful when you’re filling out the ‘Specially Designed Instruction’ section of the IEP. Do you currently include student perspectives when setting IEP goals? If so, what information do you find helpful and how to you gather this information? Have you had a situation or can you think of a time when student perspective should not be included?